Things have been quiet at the Magic Appreciation Tour for the past couple of months, and now I’m ready to reveal why. I’ve been busy working on new site software so I can support more reader and author features without having to do a lot of manual page tweaking. Plus, some things just can’t be done without some kind of database behind them. The new web site looks pretty familiar on the outside, but if you look closely, you’ll see several enhancements for both readers and authors. The Books and Authors pages now have paging so your browser doesn’t have to load the entire list of books and their cover images. As new authors register for the site, the load time on those pages would have just kept getting worse and worse. The Books page now lets you sort books by how recently they were added to the site or by author last name. By default, the list is sorted by recency, so readers who return to the site can quickly see what has been added since their last visit. You can also filter the book list by price range, sub-genre, and book length. Are you only interested in short stories? Do you want to avoid certain sub-genres? The filtering tools let you zoom in on just the books that interest you. Author and Book listings now link to a Meet the Author page that shows the author bio along with all of the books by that author on the site. 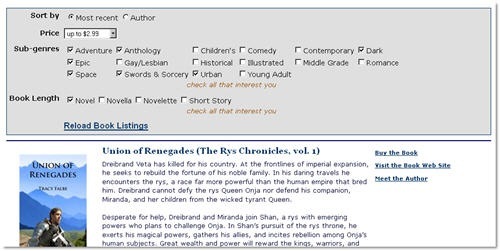 These summary pages are great for readers who find a favorite author, and they are great for authors who want to promote their magical fantasy works in one place. A membership area that let authors add new books as well as update their author and book listings. Easy opt-in/opt-out to the Magic Appreciation Blog Tours email list. To be honest, the new automated registration system benefits me, the site administrator, more than anyone. I no longer have to copy and paste information out of an email, manually resize images, and manually update the web pages with new HTML. However, authors also benefit because they can preview their author listing and book listings as they enter them and see exactly what the listing will look like when it goes live. Authors no longer have to send me a separate email with an author photo and book cover image because the images can be uploaded during registration. Also, the turnaround time from registration to being live on the site has been reduced because all I have to do now is click an “Approve” link to make the listing go live. The heart of the new registration feature is the new membership area. When you register, you create a login that lets you return at any time and add new listings or update your existing ones. All changes have to be approved before they go live on the site, but after a quick review of the listing, approval is a one-click operation for a site administrator. The Magic Appreciation Blog Tours has turned out to be a great addition to the Magic Appreciation Tour. Several of our authors have taken advantage of free touring, and many others have benefited from the offers of guest blog posts. Authors can now easily join the blog tours (or unsubscribe from the list) from their profile page. One of my tasks with making the new site go live was to enter all of the existing author profiles and books into the new database. While doing that, I created login accounts for all existing authors. I plan to send out an email to each author that includes the new login information, but if you want to go check out the new membership features immediately, just Contact me me and I’ll send it to you right away. Also, be aware that many of the listings exceeded the 800-character limit I specified on the original registration page. That limit has been expanded to 850 characters, and the new registration page does not let you put in more than that. In some cases, I had to trim down the author bio or book description to fit. Please review your listings and update them (again, contact me for a login) if you don’t like the way I edited them. The only major site feature that I eliminated was the Post Exchange. To some degree, the blog tours replace that feature. For authors who just want to do a single exchange rather than a full tour, it is easy enough to simply contact other MAT authors through their blog, as many of our authors have already done. Putting a database behind the site gives me flexibility to add more reader features and author features. I’m open to suggestions, so if you have any ideas for useful tools that could be added to the site, let me know in the comments or send me a message through the MAT contact page. Group promotions: MAT authors would sign up to participate in a group promotion on a specific date or range of dates. The site would give us a “hub page” for the promotion with links to the participating author blogs and book listings. Giveaways: MAT authors could sign up for a giveaway that the site would manage for them. This feature would be similar in concept to a RaffleCopter giveaway. RSS feed: Readers could sign up for a book registration feed, so every time a new book is added to the MAT, they’d be notified. Readers could subscribe to this feature through an email notification as well as an RSS reader. More buy links: The site currently supports a single buy link for each registered book. That means authors have to choose one retailer and one format for promotion on the Magic Appreciation Tour. I’d like to make it so authors can add multiple buy links that specify different vendors, different formats, and different prices. Check out the new site and feel free to let me know what you think. I look forward to new opportunities to make the Magic Appreciation Tour a more fun and useful tool for all magical fantasy readers and authors. Cynthia Ravinski was the first Magic Appreciation Tour author to take advantage of our new Magic Appreciation Blog Tour feature. Thank you to all of our authors who graciously offered to host Cynthia on her tour. Cynthia’s goal for her tour was to get the word out about a new form of publishing called “emotobooks.” Emotobooks combine fast-paced writing with colorful abstract artwork. This combination stimulates multiple parts of the brain for an immersing and saturating reading experience. This new medium of fiction was created by her publisher Grit City Publications. If you would like to learn more about this fascinating concept, you can still follow Cynthia’s tour using the links below. She toured with six guest posts (one of which includes an excerpt from her book) and one interview. Enjoy! One of the main goals for the Magic Appreciation Tour is to help authors connect with other authors who write in the magical fantasy genre. I think the MAT achieves that goal. We’ve engaged in conversations with one another, we’ve read each other’s works, and we’ve shared our blogs. The seasonal Post Exchange has helped facilitate our efforts. I originally wanted to give our authors a way to do some kind of virtual blog tour, but at the beginning, we just didn’t have enough authors to do a credible job. The Post Exchange was a baby step. It gave us a way to exchange single posts with each other. Well, we now have 34 authors who have listed a total of 52 books with the Magic Appreciation Tour! Granted, not all of them participate in the social networking aspects, but many of them do. I’m sure that everyone who has participated would say that we have a friendly, supportive, and motivated group of authors to work with. At this point, I think we can take virtual blog touring to the next level. That’s why I’m introducing Magic Appreciation Blog Tours (MABT) starting with the Fall 2012 Tour in September (yes, beginning next week). 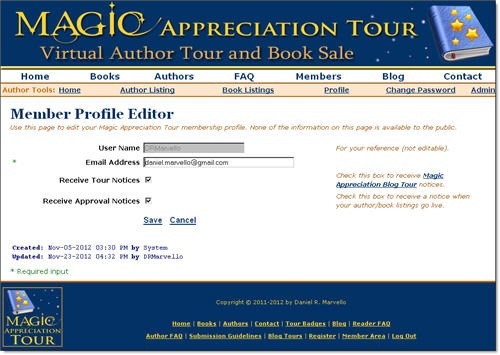 Everyone who wants to participate will be added to the Magic Appreciation Blog Tours list. You can unsubscribe from this list at any time if you change your mind. When you are ready to schedule a blog tour, send me a list of tour dates. These are the dates you can commit to providing a guest post or interview. I’ll send your request out to the authors who are subscribed to the MA Blog Tours list. Participating authors review your tour dates, and they email you with the dates they can offer on their blog. You review the responses you get and finalize a schedule with the authors who contacted you. Now you may be wondering how much this is going to cost. After all, scheduling a blog tour through a service that specializes in such things can be spendy. Well, don’t sweat it. The Post Exchange was a free service, and so is the MABT. All I ask is that you do your best to help each other out by offering your fellow writers a spot on your blog when they need it. For the moment, I’m going to keep the Post Exchange going for authors who want to do one-off exchanges of blog posts rather than doing a full-on “blog tour.” But eventually, I see replacing the Post Exchange with this facility because it is a lot easier for me to administer. It is so much easier that I can keep the MABT running all year, allowing our authors to do a blog tour whenever it is convenient (or timely) for them. Besides, one of the nicest things about the MABT is that you get to decide how many dates you want to include in your tour, regardless of how few or how many that is. I already have two authors who have expressed interest in doing tours, so I’d like to get everyone who wants to participate on board before September 1. You are welcome to join after that too, but you might miss some of the early opportunities to participate. Just so everyone knows what to expect, I’m including some participation guidelines. I want to keep the process as simple as possible and to avoid inundating MABT participants with emails. I will only use the MABT list for the initial request for tour dates. After that, communication is private between the touring author and the authors who agree to host dates. In the guidelines below, a “TOURing” author is the author who is doing the blog tour, and a “HOSTing” author is an author who is hosting a tour date on his/her blog. A “tour period” begins on the 1st of the selected start month and spans one full month or two full months. TOURing authors may not schedule concurrent tour periods (in other words, pick a schedule and stick to it). If plans must change, please give HOSTing authors at least three days advance warning. The tour dates offered by the TOURing author within the tour period represent the date posts should be published on the HOSTing author’s blog. The TOURing and HOSTing authors work out the details of when the post will be delivered and what time it will be posted on the HOSTing author’s blog. TOURing authors should include the following in their tour requests: Name, email address, goal for the tour, the month(s) of the tour, and specific tour dates. You should also indicate whether you want to do interviews, guest posts, giveaways, or are open to all of the above. For now, the MABT is open to Magic Appreciation Tour authors only. I hope the majority of our authors choose to participate. For hosts, it’s a good way to get some free, interesting, and relevant material for your blog, and it’s a nice way to help out your fellow authors. For touring authors, it’s a good way to get the word out about your latest release or to drum up new interest in a prior release. Magic Appreciation Tour authors who are interested in participating should contact me through the Magic Appreciation Tour Contact page. For now, all I need is your name and email address to put you on the MABT list.